Home / Christian News / Forgiveness / The Torn Veil - What Did It Mean? The Torn Veil - What Did It Mean? So what’s the significance of the temple curtain being ripped? Most Christians will say that it’s the moment that free access to God was won. The curtain, which hitherto had kept God hidden from people and at a distance, was now dramatically rendered obsolete. Jesus’ death had granted access to God for all. This strange event, therefore, is seen as a good thing. The author here, writing from within the Jewish framework that held the temple to be the heart of Jewish life, informs his readers that through the work of Christ the entire temple cult had been fulfilled. He argues that Jesus did everything the temple was designed to do, namely provide atonement for sin and access to God, and he had done so once and for all. Jesus was the ultimate High Priest who had blazed a trail to God, allowing his followers to be cleansed and have free and permanent fellowship with the one true holy God. As such there was no need for ethnically Jewish Christians to return to the old temple service, or even to desire the rebuilding of the temple (I understand the pretext for the author writing the letter was to articulate a specifically Christian response to the destruction of the Jerusalem temple in AD 70. It’s this theologically potent message that we tend to read back into the moment of Jesus’ death. It almost seems like the writer to the Hebrews had this particular moment of the Gospel story in mind in framing the excerpt quoted above. However, as important as this point was to the writer of the Hebrews, I do not believe he was saying that this was the significance of the tearing of the temple curtain. For a start, note that he equates the temple curtain with Jesus’ flesh, not with the actual curtain that used to hang in the temple. The writer to the Hebrews sees Jesus himself as the one who joins the divine and human worlds, and interprets the significance of his work as akin to one going through the temple curtain, as the High Priest used to do. In other words, the temple curtain provides the writer with an image he can use to talk about the import of Jesus’ work in fulfilling what the temple stood for. In this way, he uses the temple curtain metaphorically and positively. The Gospel writers, on the other hand, were making a rather different point. I believe that they were specifically portraying the tearing of the temple curtain as an ominous sign—a prefiguring of judgement. Let me explain. Jesus then proceeds to tell his disciples that not one stone of the temple will be left on another. In addition to these events, Jesus also curses a fig tree, which then withers and dies. The gesture is symbolic of the judgement to come upon Israel. The fact that it withers has a sense of permanence: Israel has rejected Jesus, the Chosen One sent from God, and as a result the covenant nation is being brought to an end. Matters come to a head when Jesus is arrested and the nation’s authorities succeed in having him crucified. Their rejection of God’s Chosen One—the messiah of Israel—is complete. 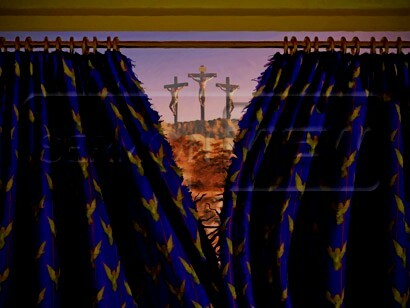 And so, as Jesus dies, the curtain is torn asunder to confirm the judgement that Jesus has pronounced upon the nation. Note also the roughness of the action—it is a ripping, rather than a parting, raising, or drawing aside. It is suggestive of violent destruction. In all of this, God validates that Jesus was indeed the messiah, and also expresses his displeasure at his covenant nation for their rejection of him. The scene is somewhat reminiscent of Ezekiel 8–11, where God takes Ezekiel on a visionary tour of the temple to show him the multiple abominations that have forced him to abandon the temple to destruction by the Babylonians. The Synoptic writers depict Jesus’ death as a similar abomination that leads to the downfall of the nation and the loss of its temple—something that would ultimately occur a generation later in AD 70 when the Romans put down the Jewish Revolt and razed the temple to the ground. One might say that the tearing of the temple curtain is how the Gospel writers imply that God was bringing down the curtain on old Israel and its temple. It was 586 BC all over again! This feature of the Gospel storyline, therefore, is not seen as a positive thing. It is symbolic of the end of old Israel, and of the temple destruction in AD 70. However, the Evangelists are also keen to say that there is hope beyond this destruction. The community that Jesus gathers around himself is the beginning of a new people of God—one that will survive AD 70. Thus, the Gospels depict the curtain tearing as a moment of judgement. Yet, they are still very much in the spirit of what the writer to the Hebrews was saying to his readers. The new community of Jesus’ followers are in no need of a temple building. All they need is Jesus himself. The veil separated the people from the temple’s Most Holy Place, and it had done so for centuries. According to tradition, the veil—a handbreadth in thickness—was woven of seventy-two twisted plaits, each plait consisting of twenty-four threads. The veil was apparently sixty feet long and thirty feet wide. The fact that it was torn apart from the top down indicated that the tearing was an irrevocable act of God in Heaven that gave people access to Him. This tearing reflected the rending of Christ’s body on the cross. He had just breathed His last. Death by suffocation, death on the cross — it was finished. Yet it was also the beginning — the commencement of a new kind of intimate relationship between God and His people. Christ’s death on the cross removed every obstacle that has separated — and could ever separate — people from God. Our Most Holy God is now accessible to everyone through Jesus Christ. It is we ourselves who erect any barriers that exist between God and us. What barriers are you choosing to let stand? Jesus died to bring them down.